It’s not every day that Thoroughbreds return to the racetrack after being retired for stud. However, Al Shaqab Racing’s 2014 Breeders’ Cup Classic (Grade I) runner-up Toast of New York, a now 7-year-old gelding, is poised to come back into limelight in Saturday’s $200,000 Lukas Classic Presented by Budweiser (Grade III), a race that could prove pivotal en route to the Breeders’ Cup Classic (GI) on Nov. 3 at Churchill Downs. 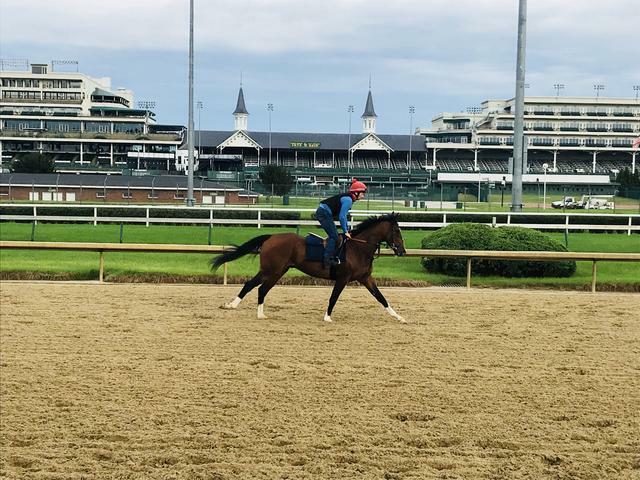 Toast of New York arrived at Churchill Downs on Tuesday and trained Thursday and Friday following his mandatory 42-hour quarantine period from the Department of Agriculture. Osborne is expected to arrive in Kentucky late Friday evening, according to McCarthy. Toast of New York has had a whirlwind of a career. The son of Thewayyouare won the 2014 UAE Derby (GII) by 2 ½ lengths prior to his controversial runner-up finish in that year’s Breeders’ Cup Classic where the narrow winner Bayern appeared to crowd multiple horses out of the gate. Following a stewards’ inquiry, no action was deemed necessary and the result stood as is. In late 2015, it was announced Toast of New York was retired to stud in Qatar following a tendon injury. He returned to Osborne’s stable in 2017 after his injury healed and was eventually gelded. Toast of New York returned to the racetrack on Dec. 6, 2017 where he defeated four rivals in a 1 ¼-mile conditioned-stakes event over the synthetic surface at England’s Lingfield Park. Toast of New York then traveled to Gulfstream Park in Florida for the $16 million Pegasus World Cup Invitational (GI) but finished well behind eventual Horse of the Year Gun Runner. Saturday night will mark Toast of New York’s first start since the Pegasus and will face the likely heavy-favorite Mind Your Biscuits, who is using the 1 1/8-mile race to prep for the Breeders’ Cup. Jockey Julien Leparoux will have the call on Toast of New York and will break from post No. 4 at odds of 15-1 on Mike Battaglia’s morning line. The complete Lukas Classic field from the rail out (with jockeys, assigned weights and morning line odds): Honorable Duty (Corey Lanerie, 121, 5-2); Remembering Rita (Alex Birzer, 123, 15-1); Rated R Superstar (Brian Hernandez Jr., 123, 12-1); Toast of New York (Leparoux, 121, 15-1); Flowers for Lisa (Jose Ferrer, 121, 15-1); Mind Your Biscuits (Tyler Gaffalione, 121, 1-1); Term of Art (Shaun Bridgmohan, 121, 10-1); and Breaking Lucky (Ricardo Santana Jr., 121, 6-1). Presented by Budweiser, the theme for Saturday night’s “Downs After Dark” event is “Bourbon & Beats.” Guests are encouraged to wear shades of purple and stay on trend with autumn fashion as they celebrate a pairing of Kentucky sounds and spirits. Admission gates open Saturday at 5 p.m. and the final race of the evening is scheduled for 11:10 p.m. General admission is $10 and reserved seat packages start at $25, which are available for purchase on www.churchilldowns.com. LANDEROS ‘THRILLED’ WITH OPPORTUNITY TO RIDE WARRIOR’S CLUB IN SATURDAY’S ACK ACK – Saturday’s $100,000 Ack Ack Presented by GE Appliances (Grade III) will mark the third time that jockey Chris Landeros has sat aboard multiple-stakes winner Warrior’s Club, and the 30-year-old journeyman rider hopes to celebrate with the Churchill Downs Racing Club’s 200 members in the winner’s circle. Warrior’s Club has earned $703,104 with five victories in 27 lifetime starts. The 4-year-old colt by Warrior’s Reward debuted in 2016 for the Churchill Downs Racing Club – a group of 200 racing fans that paid a $500 fee which grants access to a behind-the-scenes look of horse ownership. To date, more than 50 club members have branched off and joined other horse ownership groups. Trained by Hall of Fame conditioner D. Wayne Lukas, Warrior’s Club was victorious in the 2016 edition of the Spendthrift Juvenile Stallion Stakes and 2018 Commonwealth (GIII). He also was the runner-up in Saratoga’s Alfred G. Vanderbilt Handicap (GI) on July 28, and most recently finished last of eight in the Aug. 25 Forego (GI). The one-mile Ack Ack is scheduled as the eighth race at 9:39 p.m. The complete field, in order of post position (with jockey, trainer and morning line odds): Awesome Slew (Corey Lanerie, Mark Casse, 6-1); Giant Expectations (Julien Leparoux, Peter Eurton, 3-1); Flatlined (Joe Rocco Jr., Scooter Dickey, 20-1); Warrior’s Club (Landeros, Lukas, 6-1); Nice Not Nice (Gabriel Saez, Buff Bradley, 20-1); Seeking the Soul (Brian Hernandez Jr., Dallas Stewart, 2-1); and C Z Rocket (Shaun Bridgmohan, Al Stall Jr., 2-1). TIGERS RULE HOPES TO RETURN TO FORM IN $100,000 JEFFERSON CUP – Secure Investments and Vickie Foley’s Tigers Rule nearly experienced his first stakes victory when he crossed the wire a nose behind Flameaway in last year’s Bourbon Stakes (Grade III) at Keeneland but the 3-year-old hopes to return to his top form in Saturday’s 42nd running of the $100,000 Jefferson Cup (Listed) at Churchill Downs. Tigers Rule is a son of Kitten’s Joy out of the Tale of the Cat mare Lone Tigress. The Kentucky-bred’s record is 7-2-2-1 with $165,700 in purse earnings. The Jefferson Cup, for 3-year-olds, is scheduled to run at 1 1/8 miles on the Matt Winn Turf Course as Race 7 with a post time of 9:05 p.m. The field, from the rail out (with jockey, trainer and morning line odds): Discovered (Declan Cannon, Daniel Sanner, 20-1); Armed for Battle (Robby Albarado, Jen Patterson, 20-1); Tigers Rule (Graham, Foley, 6-1); Factor This (Shaun Bridgmohan, Brad Cox, 12-1); Hot Springs (Santana, Asmussen, 3-1); Majestic Eagle (Brian Hernandez Jr., Neil Drysdale, 5-2); Silent Citizen (Albin Jiminez, Efren Loza Jr., 20-1); Captivating Moon (Corey Lanerie, Chris Block, 3-1); King Valero (Samuel Camacho Jr., Alejandro Gonzalez, 20-1); and Dubby Dubbie (Jack Gilligan, Michelle Lovell, 8-1). BREEDERS’ CUP CONTENDERS PROMISES FULFILLED, WHITMORE BREEZE IN THE FOG – Dense fog set in at Churchill Downs early Friday morning which made it nearly impossible for clockers and horseman to watch horses train. Nevertheless, Forego Stakes (Grade I) winner Whitmore and Allen Jerkens Stakes (GI) hero Promises Fulfilled breezed prior to facing off in next Friday’s Phoenix Stakes (GII) at Keeneland – a “Win and You’re In” race for the Breeders’ Cup Sprint (GI) to be held Nov. 3 beneath the historic Twin Spires. Whitmore, the speedy-son of Pleasantly Perfect, trained when the track opened at 5:30 a.m. (all times Eastern) for trainer Ron Moquett, who also co-owns the 5-year-old gelding with Robert LaPenta and Head of Plains Partners. Whitmore (22-11-5-2—$1,991,000) is possible for both the Breeders’ Cup Sprint and Dirt Mile (GI). Nearly three-hours after Whitmore exited the track, Bob Baron’s Promises Fulfilled trained for Churchill Downs’ all-time leading trainer Dale Romans. The 3-year-old colt by Shackleford will be seeking his third-consecutive victory in the Phoenix following victories in the Amsterdam (GIII) and Allen Jerkens (GI) at Saratoga. QUICK SAND AA TRIES FOR FOURTH GRADE I WIN IN SATURDAY’S PRESIDENT OF THE UAE CUP – Betty and Joseph Gillis’ three-time Grade I-winning Arabian-bred Quick Sand AA was installed as the 2-1 morning line favorite in Saturday’s $100,000 President of the UAE Cup (GI) at Churchill Downs. Quick Sand AA, a gray 5-year-old son of Burning Sand out of the Gillis’ homebred Triumphs Silkie, recently defeated eight rivals in the Delaware Classic Handicap (GI). The Mississippi-bred has tallied 10 victories in 22 starts with $203,191 in earnings. The complete field for the President of the UAE Cup in order of post position (with jockey, trainer and morning line odds): Quick Sand AA (Sasha Risenhoover, Jerenesto Torrez, 2-1); Quick and Rich (Joe Rocco Jr., Lynn Ashby, 5-1); Burn Notice MC (Carlos Esquillin, Wallace Neilson, 30-1); Easter Man (Keiber Coa, Torrez, 5-2); Uptown Sandy Girl (Corey Lanerie, Ashby, 7-2); Mystical MHF (Ryan Powell, Simon Hobson, 20-1); RB Hocus Pocus (Ty Kennedy, Hobson, 20-1); and Madjikman (Shaun Bridgmohan, Fenneka Bentley, 12-1). DOWN THE STRETCH – Racing continues Friday with a 10-race card that features a $1 Super Hi 5 carryover of $15,993 in the finale. The first race is 12:45 p.m. (all times Eastern). … Friday’s episode of “Inside Churchill Downs” will air at 6 p.m. on ESPN 680/105.7 and feature trainers Brendan Walsh and Ron Moquett and TwinSpires.com handicapper Scott Shapiro. Those outside the Louisville market can listen to the show on www.espnlouisville.com. … Saturday is Downs After Dark Presented by Budweiser. Gates open for the 11-race program at 5 p.m. and the first post is 6 p.m. The theme for evening is “Bourbon and Beats” and guests are encouraged to wear autumn-inspired purple colors. For more information about Downs After Dark, visit: https://bit.ly/2Qfn7VX. … Sunday is the final day of the September Meet with a 10-race card beginning at 12:45 p.m. … Godolphin Racing’s Thunder Snow (IRE), who is slated to run in Saturday’s Jockey Club Gold Cup (GI) at Belmont Park, is scheduled to arrive at Churchill Downs’ Barn 17 on Monday to prepare for the Breeders’ Cup Classic (GI), according to Director of the Stable Area Steve Hargrave.